On the June solstice, the sun will set at the same time in New York City and St. Augustine, Florida. But New York will have an hour more of daylight. How’s that happen? 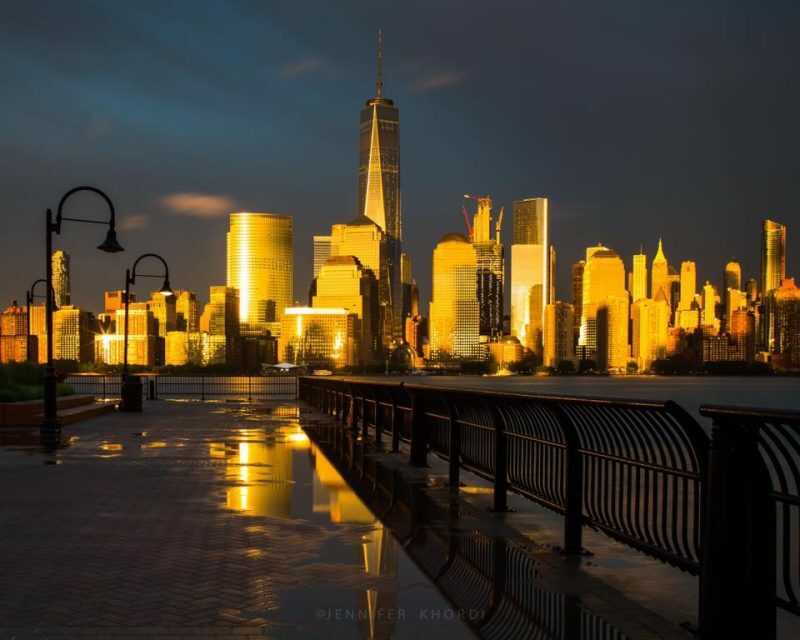 Sunset over Manhattan, June 5, 2016, by Jennifer Khordi. Visit Khordi Photography on Facebook. Around the time of the June solstice, the sun sets at virtually the same time in both New York City, New York, and St. Augustine, Florida. 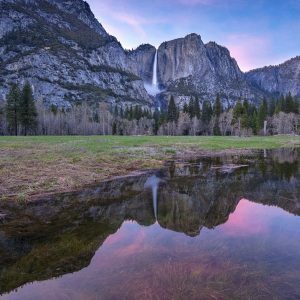 On June 21, 2019, the sun sets around 8:30 p.m. Eastern Daylight Time (EDT) in both places. What’s going on here? Doesn’t the sun set later farther north at this time of year? What about the phenomenon of midnight twilight and midnight sun, after all? It’s true that – for places farther north in summer – the sun stays out longer. But St. Augustine lodges about 7.5 degrees of longitude to the west of New York City. Our planet takes about 30 minutes to rotate this 7.5 degrees. Therefore, on any day of the year, the sun reaches its noontime position some 30 minutes later in St. Augustine than it does in New York City. For instance, on June 21, 2018, the noonday sun reaches its high point for the day at 12:58 p.m. EDT in New York City – yet in St. Augustine, solar noon comes about 30 minutes later, at 1:27 p.m. EDT. Because New York is appreciably north of St. Augustine, New York’s afternoon daylight (from solar noon to sunset) lasts some 30 minutes longer on the day of the June solstice than it does in St. Augustine. Thus, the longer period of daylight in New York cancels out the later noontime appearance of the sun in St. Augustine, to give both localities the same sunset time on the day of the June solstice. The table below helps to clarify. New York 5:25 a.m. 12:58 p.m. 8:30 p.m.
St. Augustine 6:25 a.m. 1:27 p.m. 8:29 p.m.
NYC and St. Augustine both use Eastern time. But the noonday sun comes 30 minutes later to St. Augustine because it resides 7.5 degrees of longitude west of New York City. In other words, from sunrise to sunset on the June solstice, New York City has about an hour more daylight than St. Augustine does. (That’s 30 minutes more morning daylight and 30 minutes more afternoon daylight.) Although the sunset occurs at virtually the same time for both cities, the sunrise happens an hour earlier in New York City. Look again at the sunrise/solar noon/sunset table above. 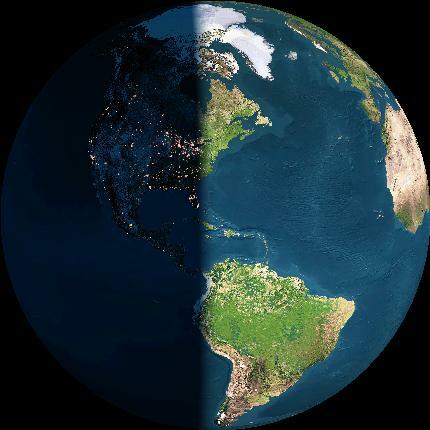 Earth’s terminator – line of sunset – nearly parallels the Eastern Seaboard on the day of the June solstice. 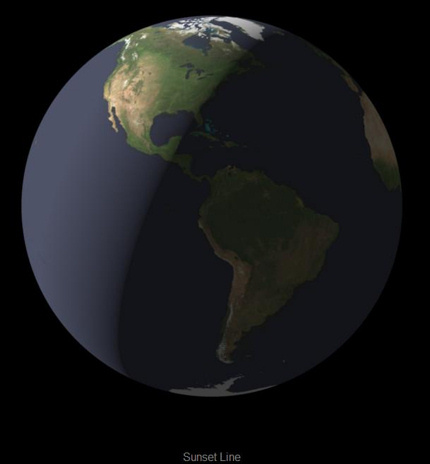 The image above is a simulated view of Earth as the sun is setting around the time of the June summer solstice. 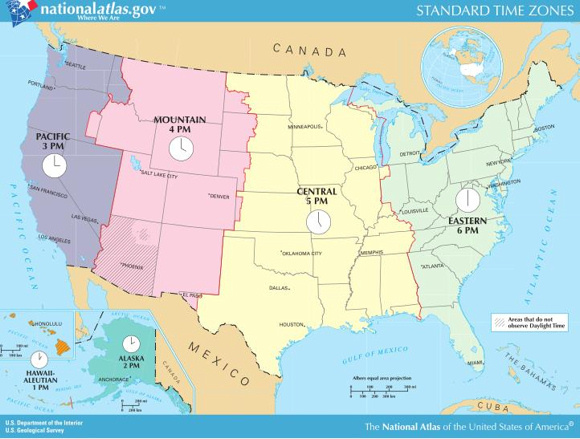 Note that the terminator pretty much aligns with the U. S. East Coast, providing a similar sunset time for coastal dwellers. 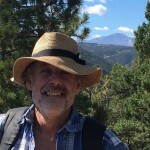 Some three – and nine – months after the June solstice, St. Augustine and New York City receive the same amount of daylight on the days of the September and March equinoxes. On the equinoxes, noontime as well as sunrise and sunset come 30 minutes later in St. Augustine than they do in New York City. 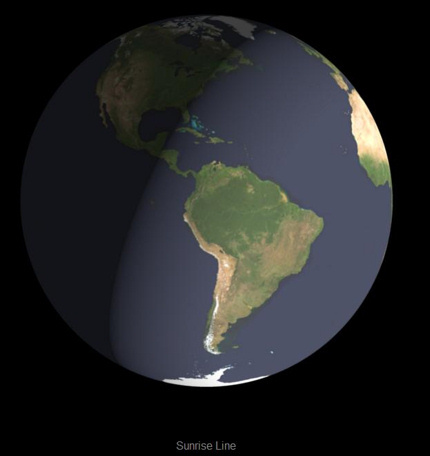 The simulated view of Earth below shows the terminator – the sunrise line – running due north and south on the equinox. Neither the sunrise terminator nor sunset terminator comes anywhere close to aligning with the U.S. East Coast at either equinox. New York 6:44 a.m. 12:48 p.m. 6:53 p.m.
St. Augustine 7:14 a.m. 1:18 p.m. 7:22 p.m. The terminator – sunrise line – runs due north and south on the equinoxes. The sunset line, though not shown, also runs north and south. Image via Earth and Moon Viewer. New York 6:59 a.m. 1:03 p.m. 7:09 p.m.
St. Augustine 7:29 a.m. 1:33 p.m. 7:37 p.m.
Six months after the June solstice, it’s the December winter solstice for the Northern Hemisphere, coming yearly on or near December 21. Now, the situation is reversed from the June solstice, with St. Augustine receiving an hour more daylight than New York City. Simulation of the line of sunrise as it hits the U.S. eastern seaboard around the December solstice. Image via U.S. Naval Observatory. Look above at the simulated view of Earth as the sun is rising over the Eastern Seaboard of the United States on the day of the winter solstice. Note that the terminator – the sunrise line – pretty much coincides with the East Coast, giving a similar sunrise time for residents along the Atlantic Seaboard. New York 7:16 a.m. 11:54 a.m. 4:31 p.m.
St. Augustine 7:17 a.m. 12:23 p.m. 5:30 p.m.
From sunrise to sunset on the day of the winter solstice, St. Augustine residents enjoy about an hour more daylight than those in New York City. Although the sunrise occurs at about the same time for both cities, the sunset happens an hour later in St. Augustine on the day of the winter solstice. Bottom Line: On the day of the June summer solstice, the sun sets at the same time in both St. Augustine, Florida, and New York City, New York. However, New York City enjoys an hour more daylight. Six months later, on the day of the December solstice, it’s the exact opposite. It’s the sunrise that happens at the same time in both places, yet it’s then St. Augustine’s turn to enjoy an extra hour of sunshine.